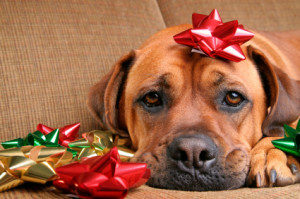 The holidays are not just stressful for us, but they can be stressful and confusing for our dogs too! This year, instead of recapping that dogs should stay away from chocolate and high fat table scraps with deadly bones, and to keep Mittens the kitten away from the Christmas tree, strands of tinsel or Christmas lilies (which is also very important), I am going to discuss some tips on keeping stress levels low and happy levels high. The Holidays can really take a toll on our dog’s training progress and can cause extra stress to an already fearful (or even confident) dog. This is the time of year when house guests overtake your home and training your dog to have “4 Feet on the Floor” -to not jump up- takes a big leap (no pun intended) backwards. Whether it is your cousin Bob who insists “dogs love me”, or your Aunt Polly who is “not a dog person”, training will likely take a back burner, some rules go out the window, and someone is bound to be overwhelmed. Probably your dog. I’ve heard lots of dog lovers struggle over what to do when company comes and their dog doesn’t do well with visitors. December 23rd and 24th can see a spike in dog bites. So sad. Don’t let that be your dog this year! Here’s some simple advice about holidays and dogs and visitors. But remember to keep everyone safe, think about your dog first and foremost! Traveling: Do you REALLY want to take your dog to that big family gathering? How fun is it going to be when you discover that your nephew is allergic to dogs, or your sister-in-law brought her three barking Chihuahuas? For everyone’s sake, seriously consider leaving your dog at home, either at a reputable kennel or with a great dog sitter. This could be a blessing to your dog, to you, and to the rest of your family. Of course, in some cases bringing your dog just adds to the fun, and if that’s the case, then bring ‘em along! But if you’re not sure, then discretion is the better part of being a holiday hero. House Guests: If visitors are coming to you, do what most professionals do, and thank the dog gods for crates and X-pens. It seems to be those who are most likely to put their dogs away to prevent problems, rather than crossing their fingers and saying “I think it’ll be okay…” are the ones who can be 100% sure that things will indeed be okay! Never hesitate to err on the side of caution if there is even the slightest chance of trouble between a dog and a visitor. Also, ask yourself, are kids coming over? If you’re not 110% sure about how they’ll behave around your dog, then start with your dog safely contained, meet the kids and then decide how they’ll interact. You could also consider boarding your dog in a kennel over the Holidays even if you, yourself, are not planning on leaving town. They may enjoy the peace and quiet and some canine companions. Be cautious: Dog in crate or X-pen when visitors enter. Carefully observe and manage: Watch interactions carefully. Watch body language, and watch how your house guests interact with your dog. Know your dog’s signs of discomfort, and minimize the potential for any problems. this at some point over the Holidays! Remember, when crating/kenneling your dog, give them something to do that is delicious, high value and fun! A stuffed Kong is ideal. You can change the stuffing to new and exciting flavours, and it’s a safe choice to leave with most dogs in their kennel. Here is a basic guide to stuffing your dog’s Kong: http://dogs.thefuntimesguide.com/2010/03/dog_kong.php. My dog Monday’s personal favourite is soaked kibble, with banana, cooked sweet potato and/or cream cheese. Yum! If you are unsure about the best route to take with your dog over the Holidays, if your dog has severe anxieties, or if you are looking for more alternatives and training, please contact Erin at erin@companionvet.ca for an in-home consultation.